With nearly 100 years of history, the Hillcrest Business Association continues to help shape the story of our neighborhood. 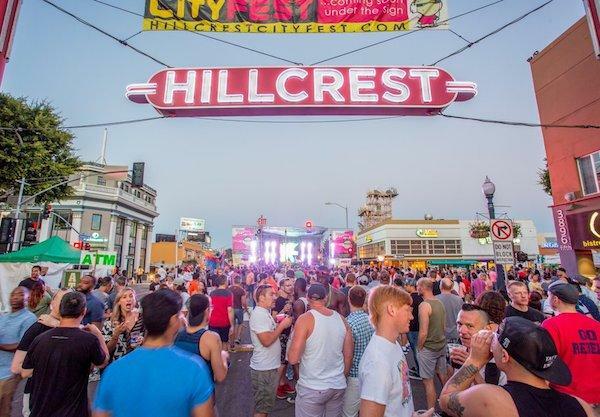 And since 1984 — that story, along with the story of the Hillcrest sign — is celebrated with CityFest, an annual street fair and music festival that draws over 150,000 people to the heart of the community every August. 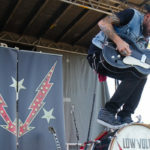 This year’s event, the Hillcrest CityFest Street & Music Festival, takes place Sunday, Aug. 13, from noon until 8 p.m., when CityFest At Night takes over the Grand Stage at the intersection of Fifth and University avenues, and runs until 11 p.m. It all began in 1886 when the area known as University Heights began to grow northward. Subdivisions soon popped up to border Balboa Park, and in 1907, William Wesley Whitson opened the Hillcrest Company to sell parcels of land, giving birth to the Hillcrest neighborhood. Florence Elementary School opened in 1908. In 1913, the Hillcrest Theater opened as the first theater house outside of Downtown. As the neighborhood expanded and grew, the Hillcrest Association was formed by a group of neighborhood business owners in 1921. In 1940, the Hillcrest Women’s Association donated a neon Hillcrest sign to the Hillcrest Association. The Hillcrest sign ultimately served to help the neighborhood become a destination, but over the course of the next 37 years, the sign fell into neglect. Although repainted in 1977, it was still in disrepair. In 1984, Hillcrest residents and business owners launched an effort to refurbish the Hillcrest sign and on Aug. 18, 1984, a newly restored sign was reinstalled. Two weeks later, on Aug. 26, the new sign was officially unveiled and celebrated; marking the first event we now call CityFest. 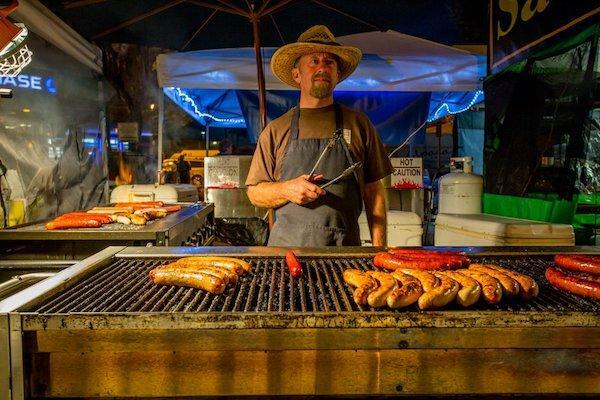 Since that first celebration in 1984, the now-named Hillcrest Business Association has hosted CityFest during August, boasting the most spirited street festival in San Diego. 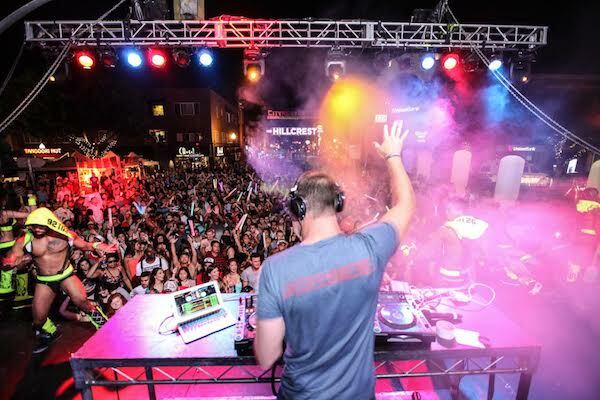 Today, Hillcrest locals join neighboring San Diego visitors to celebrate the sign and welcome the spirit of Hillcrest for a free, daylong celebration that lasts from noon until 11 p.m. — making it the largest single-day street and music festival in San Diego County. 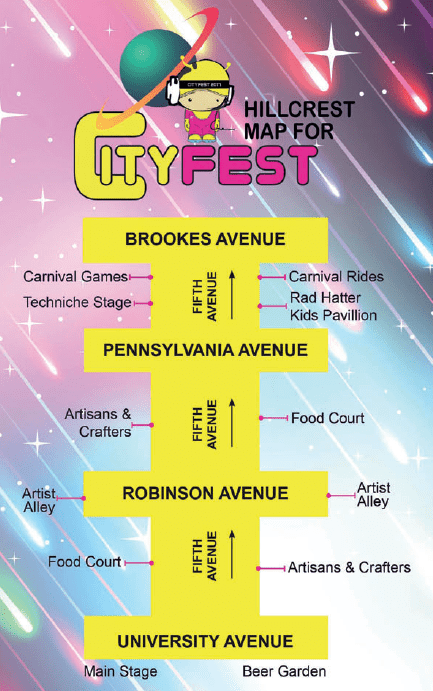 CityFest’s Artist Village on Fifth Avenue between University and Robinson avenues and Artist Alley located on Robinson Avenue between Fourth and Sixth avenues, together offer one of the largest arts and crafts areas of any comparable street fair. Over 250 vendors will provide plenty of shopping opportunities, and Hillcrest’s quaint shops and restaurants will offer more places to dive into. 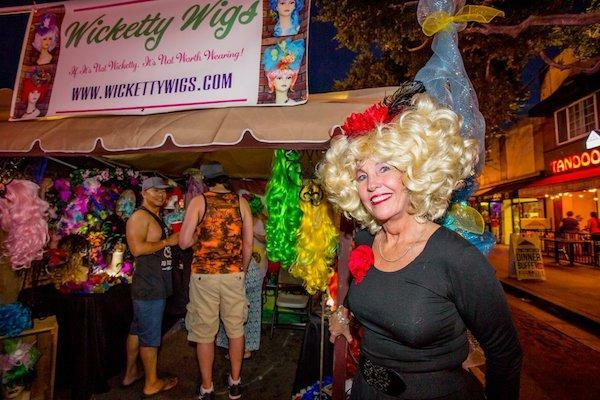 Vendor booths lining both areas will give visitors much to peruse and explore, especially to find one-of-a-kind specialty items and gifts. 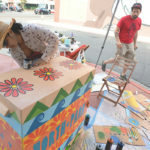 The CityFest Grand Stage will be located in the heart of Hillcrest at the corner of University and Fifth avenues and hosted by community legend Laura Jane Willcock. Laura Jane will guide attendees through multiple local and regional musical acts throughout the day, from noon until 8 p.m. Then as the walking and interactive aspect of the festival dies down, local and regional DJs will take over for CityFest at Night from 8–11 p.m.
With more than 50 food vendors, CityFest’s two food courts will offer lots of variety for hungry attendees. Food vendors can be found along Fifth Avenue between Robinson and Pennsylvania avenues, as well as between University and Robinson avenues. CityFest welcomes youngsters of all ages. 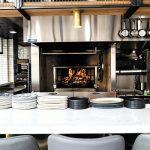 The Pavilion, located on Fifth Avenue between Pennsylvania and Brookes avenues, has something for everyone. This giant playground returns with Lexy the Face Painter; Ms. Twisty the balloon artist; the Rad Hatter, where you can make your own party hats; a kid’s garden; a petting zoo; carnival rides; games; and the new Techniche Stage, offering music from DJ Myxzlplix and DJ John Vilotti from 1–6 p.m. 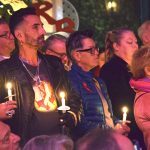 Cheer San Diego (the LGBT cheerleading group), stilt walkers and other buskers and street performers will be staged along the pavilion area and throughout the festival site. One of the popular aspects of the daylong street festival is the Beer and Spirits Garden, located on University Avenue between Fourth and Fifth avenues. 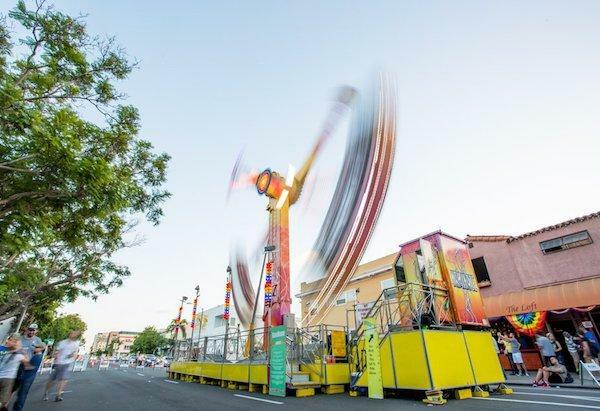 Sponsored by Cutwater Spirits, Coors Light and Blue Moon, the entire block will feature drink stations, a dunk tank and a great view of the Grand Stage from under the Hillcrest sign. 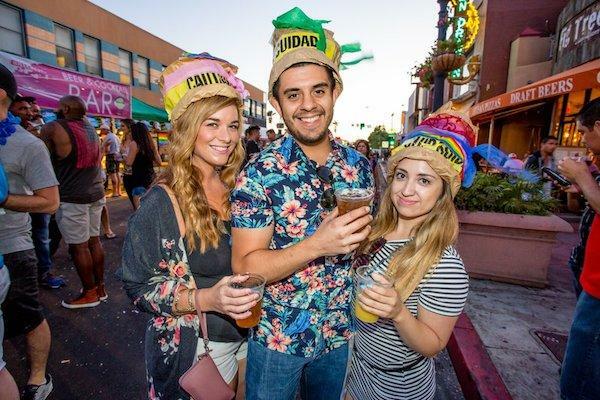 The spirits and beer garden will remain open until 11 p.m. so you can watch the CityFest at Night street party with a drink in your hand. You will have the opportunity to dunk your favorite drag queen, friend, “frenemy” or other prominent members of the community. Proceeds benefit the Hillcrest Town Council, a volunteer-driven, nonprofit organization that provides a voice for the residents of Hillcrest. Show your support for the cause by visiting the Beer and Spirits Garden and taking your best shot to Dunk-a-Queen. 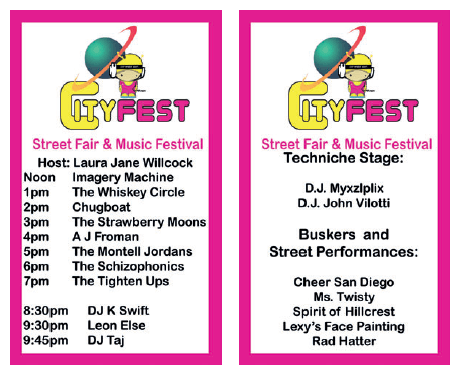 For more information about CityFest, including complete lineups for every stage, visit HillcrestCityFest.com. 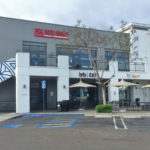 To learn more about the Hillcrest Business Association, visit hillcrestbia.org.